Dancing robots in Rittershausen | Rittal - The System. 2018-10-19. 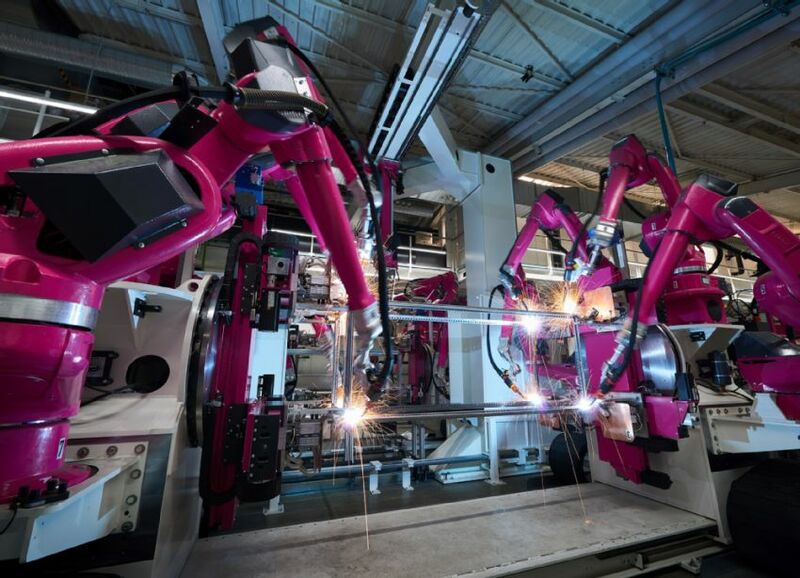 High-tech production plants that “think for themselves”, that plan things automatically and which optimise maintenance work thanks to artificial intelligence – what sounds at first like a dream of the future is becoming reality in Rittershausen, Germany, one step at a time. To produce its new VX25 large enclosure system, Rittal is now transforming its production plant “on the fly” into a factory of the future for enclosures. Visitors are impressed by the new welding and handling robots. Half the conversion work has already been completed and the Industry 4.0 factory is expected to be finished by 2020. The total investment involved has reached Euro120 million. 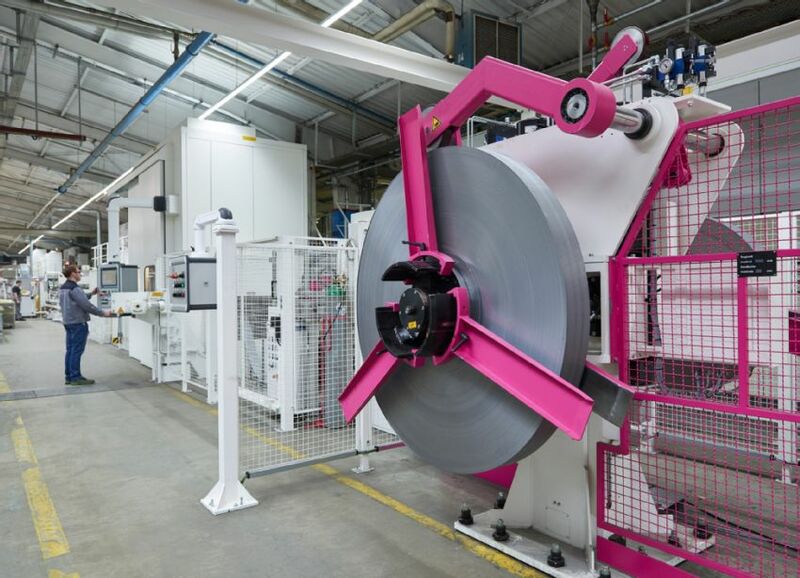 “In eighteen months’ time, nothing will look how it does now,” explains Carsten Röttchen, Managing Director International Production at Rittal. The reason behind this statement can be seen coming off the end of a new production line: The new Rittal VX25 large enclosure system. The enclosure is replacing the previous TS 8, which had enjoyed worldwide success. And it is much better than its predecessor. It draws on countless discussions with customers, a large-scale scientific user study in Germany, the USA and China, as well as five years of development work. For Rittal customers, the VX25 means an enormous level of simplification and time savings. It is also extremely stable. For example, it safely accommodates the tightly packed control and switchgear that governs the production of cars or heavy-duty energy storage units for wind turbines. “With our innovations and new product launches, we are always modernising our production facilities as well”, says Carsten Röttchen. And these facilities are now being installed step by step. Through this conversion, the company is implementing a highly complex project as if it were a metamorphosis. Because if you look at the Rittershausen production facilities right now, the transformation is becoming clearly visible. Two different large enclosure systems are currently being manufactured on the premises. Then while thousands of TS 8 enclosures are still running off the production lines on one side, the new Rittal VX25 large enclosure system is being made on the other. What is happening in Rittershausen is the beginning of a networked factory– something also known as “Industry 4.00” (IoT) production. It is a project that has got a lot to offer. “Much of this automation is based on intelligent and networked systems that think ahead, plan automatically and trigger maintenance scenarios,” explains Norbert Peter, Plant Director at Rittershausen. And he added: “This way, we can avoid any manual errors and, at the same time, speed things up even more.” In its ultimate configuration, the new enclosure will ‘grow’ on several profiling systems, each 70 metres long. These profiles form the “skeleton” of the new system; they contain a huge amount of Rittal expertise. Of the 70 new welding and handling robots, 30 have been moved into the production buildings and are already in operation. In order to enable the machines to communicate with each other, hundreds of sensors monitor the fully automatic production processes. Here, the increasing level of networking is simply the logical answer to the high demands made on both production and logistics. Consequently, the “faster-better-everywhere” approach is important in order to gain competitive advantages. This is because customers all over the world expect their deliveries to be fast and on time. Soon, Rittal will also be offering a 24-hour delivery service throughout Europe. To keep this promise, each production step must be part of the highly complex value chain. “The vision is that if a customer in Italy orders ten VX25s, our production management system here in Rittershausen will be informed automatically and will trigger production,” Mr. Röttchen explains. The employees are the most important pillars that uphold the massive process of change in the factory. That is because a great deal of understanding and commitment is required when roof segments have to be altered, or space needs to be created for new machinery or when floors that have been supporting machinery for 20 years have to be replaced. Both Mr. Röttchen and Mr. Peter are aware of just how committed their employees are and that this commitment is not something to be taken for granted. They show a high degree of flexibility during the process of work, for example by working extra shifts at weekends. “This conversion work is not a sprint for individual runners, but a marathon being run by a team. The staff play their part with conviction, something that earns a lot of respect,” says Röttchen. In order to understand and master this new world, the staff are being trained at the in-house Loh Academy. There, they are learning how the new systems function and how they are controlled. The training courses concerned are completely booked out for weeks to come. There are already more than 250 registrations. “Everyone who wants to extend their training with us is given ideal opportunities to do so. I am proud of our expertise here in Dietzhöltztal. It’s a world-beater,” says Norbert Peter.